Last week my PhD time was focused primarily on the opportunities, issues and complexities of what might be broadly termed ‘visual research’. 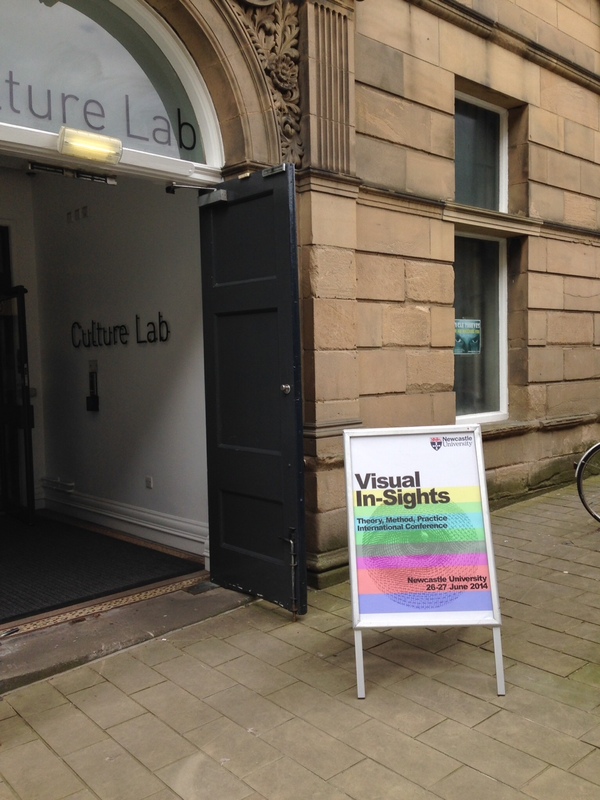 In the first part of the week I took part in the NEDTC’s ‘Developing Theory and Practice in Visual Methodology’ training, then followed this up by attending the Newcastle University Visualities Research Group’s ‘Visual In-Sights’ Conference at Newcastle’s Culture Lab. Together these two events offered a overview of different approaches to ‘the visual’ and useful prompts for thinking about my own research – both in terms of its visual subject (public art objects), its methodology and its dissemination. 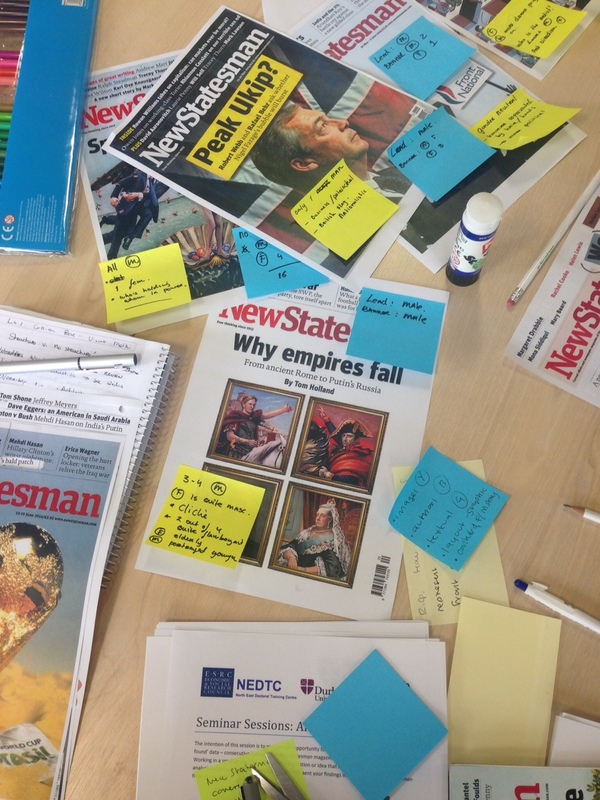 The NEDTC training offered practical opportunities to explore a spectrum of methods, tools and analytical approaches. These included hands-on group work with creative 3D modelling, visual context mapping, and found image analysis (probably the most applicable to my own research) The second day (which I wasn’t able to attend) went on to a more detailed exploration of different photo analysis protocols and tools for participant-generated data. Throughout the emphasis was on the potential of visual methods as alternatives to more standard quantitative or qualitative tools such as interviews, questionnaires, or observation. The message being that visual methods offer: a) an attractive route for participant engagement; b) a means of generating rich data; and c) an opportunity to open up more creative thinking, for both academic researchers and research participants. These issues were explored and discussed in more detail, and in relation to a range of disciplines and research project examples, in the conference presentations and panels in the second half of the week. Here, visual research ethics, the changing status of the photograph and the social/communicative nature of visual images were recurring themes. Methods and approaches went beyond the found, elicited and participatory to showcase more emerging visual research practices including: digital/multimedia storytelling; research process storyboarding; actor-network visualisation; use of visual/graphic probes; and social media analysis. Of most immediate interest to me (in my own current investigation of public art representation on photo-sharing sites) were the three presentations in the ‘Visualities and Social Media’ panel by current PhD candidates Caelli Jo Brooker, Rhys Crilley, and Elisa Serafinelli. These investigated institutional and individual image based social media activity, variously on Pinterest, Facebook and Instagram. Together this group of presentations led to an interesting discussion on visual social media analysis techniques, ethical concerns, and potentials for qualitative investigation as oppose to current enthusiasm for ‘big-data’ oriented social media research. Altogether it was a thoroughly stimulating week at the methodological interstices of the ‘visual turn’.